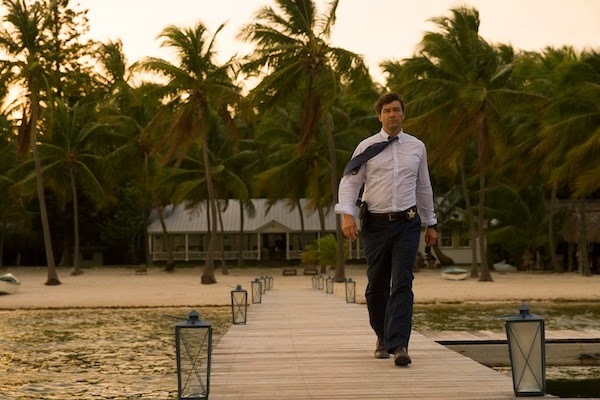 Netflix's Bloodline - Episode 1.06 "Part 6"
The grand conflict of Bloodline's first season so far has been the tumultuous dynamic between Danny, John and Robert that has been apparent since the day that Sarah drowned. Her death rocked this family to its core and has left many psychological issues that the characters are still struggling to deal with in the present day. Robert's sudden death has forced Danny and John to actively confront the past and what truly happened that day. It sends them both spiraling but in vastly different ways. Danny heads down a path of self-destruction. He has great love for his family. And yet, seeing how far the cover-up of his accident went is enough to push him over the edge. John actually gave a statement all those years ago that Danny was hit by a car. John strengthened Robert's lie. John was happy to continue living in his father's world out of fear of what would happen if the truth were exposed. That was devastating to Danny because he has lived his entire life since that day with the internalized fear that it was all his fault that Sarah died. Robert blamed him for the accident. For all we know, it truly was an accident. She drowned. Robert and Danny did their best to rescue her but were unsuccessful. Robert had a special connection with Sarah and needed to place blame somehow in order to make sense of her death. That anguish was directed at Danny. Even though he knows that it was accident, there's still that seed of doubt in the back of his mind. Danny's reaction to this news is horrible. He takes the day off from the hotel to go get drunk and do drugs with whomever happens to be nearby while pushing away those close to him. It's tragic really. He's trying to escape the pain of his life. He's not very successful because even in his drug-induced state, he is thrown into a confrontation with John. Hallucinations aren't uncommon with this kind of heavy drug use or in serial thriller narratives on TV. Yes, they can sometimes be a cheat. Showing what the characters want to do or how they feel in a way that doesn't have any consequences afterwards. And yet, this confrontation works so well because no matter what Danny does his family is still heavily on his mind. He can't escape it. He is literally haunted by the image of Sarah all grown up. The drug dream is the most honest Danny and John are with each other throughout the episode - even though it's largely Danny's own interpretation of John. It's a powerful scene because Danny feels destructive and in pain because of his family. It wasn't really funny in the beginning of the hour when he made a joke to John about having a gun. It had much more value later when he actually pulled the trigger of John's gun on himself in his drug-heightened state. He is willing to die to escape all of this pain. He doesn't continue down that avenue though. He eventually picks himself up and returns to the hotel to continue working like he has been doing lately. John is also seeing the error of his ways in the past. The dream version of John may persist that the family was simply trying to protecting Danny with the big lie. And yet, the actual John knows that he wasn't looking out for his brother during this horrible situation. The former detective is aware of how bad he failed this family in the past. The issues were allowed to fester in all of them for decades. And now, John is willing to admit that everyone fucked up in their handling of this tragedy. That's a huge step for him to admit. He doesn't know how that is going to effect his relationship with his brother. He is fighting on his behalf again - telling Meg and Kevin that if they keep Danny out of the will than they should do the same to him as well. That may be taking things a little too far. But John also doesn't know what to do considering he can't find Danny. Eventually he gets a good idea of what Danny's day out was like. And yet, all of this is building to the two of them actually have a serious talk together out on the dock. It's a fantastic scene where John feels the need to apologize for the past while Danny is so easily willing to say that all is forgiven. Their issues can't be solved just like that. Danny still has those doubts and pains within him. But right now, he's also choosing to be with his family. That includes saying that everything is good between them. They can go out fishing and everything will be fine. Things aren't fine though. Both John and Danny know that. They are brothers. They are going to go fishing. But so much work still has to be put into their relationship in order to make things okay for them. That does somewhat feel like false hope too given that the flash-forwards are teasing Danny's death. John's narration and the flash-forward device have been missing for a few episodes now. But the threat that they presented is still largely looming over the show. "Part 6" was written by Jeff Shakoor and directed by Alex Graves. There's been inconsistency with Kevin this season on whether he's angry with Danny or best friends with him. And now, there's some clarity in that the only reason he wants to keep Danny out of the will is so that he can get more money so he can buy the marina and keep the developers out of the area. The core part of the narrative is the conflict between Danny, John and Robert. That means Meg, Kevin and Sally do get cast aside a little bit. We learn where they were during Sarah's accident but there's no weight to it because the drama of this episode comes from John and Danny dealing with his lie all those years ago. Even on her online dating profile, Belle is bland. Her one and only interest is baking! Although she knew something was off with him, Sally still let Danny take the day off from work. She's also still very passionate about keeping Danny in the will. John's murder investigation is slowly making some progress. Marco tracks down a victim from another incident when her statement could provide useful information to their current case. It's still just pure exposition that feels tangential to the rest of the story. Also tangential is Meg trying to become a criminal defense attorney to help a former employee of the hotel. It may all be connected in the end but right now it just feels off. Additionally, Meg wanted Marco to propose to her. And yet, he knew better and could tell that something was off with her. He's ready to take that step but it's more important that he recognizes that she's not ready for it - even though she's the one pushing for it right now. This was one of the better episodes when it came to pacing. Everything felt deliberate. And yet, I still felt way too much time was spent on Danny's various exploits. Some of the partying felt like it lingered for too long. As noted in previous reviews from this series, every episodic review was written without having seen any succeeding episodes. Similarly, it would be much appreciated if in the comments section, the conversation would only revolve around the show up to this point in its run.